Aggregates of between laminar and tabular Roweite crystals of great size and quality for what has been known of this species. They are on matrix, with small Andradite crystals. The Roweite crystals, that are well differentiated, have a light creamy color with very well defined faces and edges. 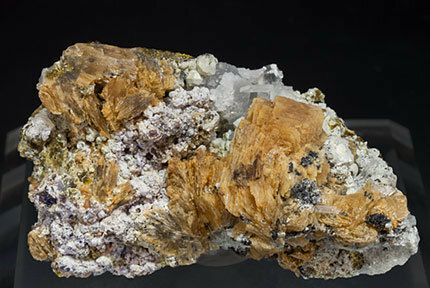 The quality of the specimens is undoubtedly superior to what was previously known, both for the individuality of the crystals and for their sharpness, but also for the size of the crystals and their association with first class Olshanskyite which makes them deserving to be in the best private collections and museums. We have analyzed specimens to confirm the identity of the species and we will send a copy of the different species to buyers. Aggregates of platy Roweite crystals of great size and quality for what has been known of this species. 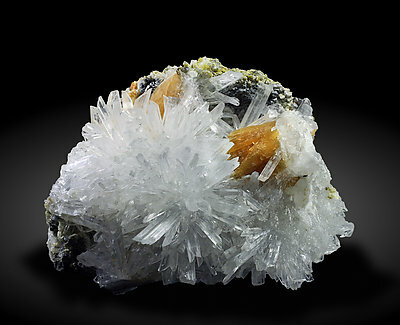 They are on matrix, with radial aggregates of colorless, clear and very bright Olshanskyite crystals, and with Calcite. The Roweite crystals, that are well differentiated, have a light creamy color with very well defined faces and edges. 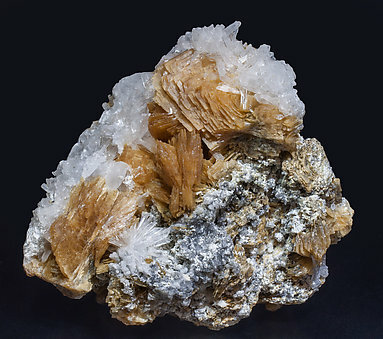 The quality of the specimens is undoubtedly superior to what was previously known, both for the individuality of the crystals and for their sharpness, but also for the size of the crystals and their association with first class Olshanskyite which makes them deserving to be in the best private collections and museums. We have analyzed specimens to confirm the identity of the species and we will send a copy of the different species to buyers. Rosette aggregates of laminar Roweite crystals of great size and quality for what has been known of this species. They are on matrix, with colorless and transparent Olshanskyite crystals. The Roweite crystals, that are well differentiated, have a light creamy color with very well defined faces and edges. 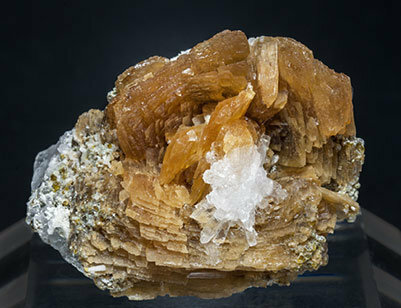 The quality of the specimens is undoubtedly superior to what was previously known, both for the individuality of the crystals and for their sharpness, but also for the size of the crystals and their association with first class Olshanskyite which makes them deserving to be in the best private collections and museums. We have analyzed specimens to confirm the identity of the species and we will send a copy of the different species to buyers. Rosette aggregate of laminar Roweite crystals of great size and quality for what has been known of this species. 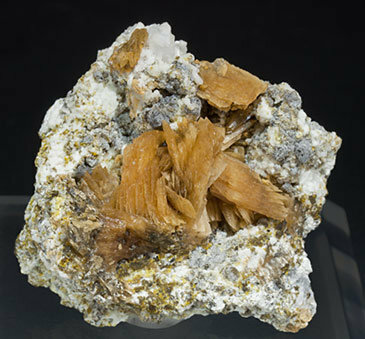 It is on matrix, with colorless and transparent Olshanskyite crystals. The Roweite crystals, that are well differentiated, have a light creamy color with very well defined faces and edges. 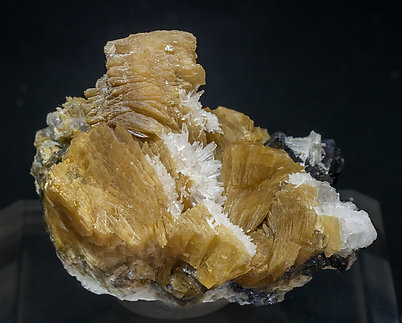 The quality of the specimens is undoubtedly superior to what was previously known, both for the individuality of the crystals and for their sharpness, but also for the size of the crystals and their association with first class Olshanskyite which makes them deserving to be in the best private collections and museums. We have analyzed specimens to confirm the identity of the species and we will send a copy of the different species to buyers. 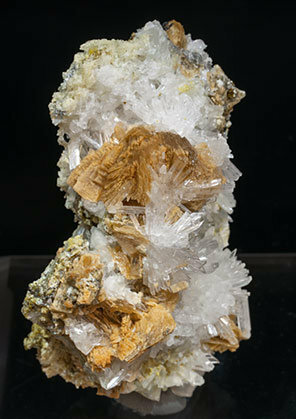 Extraordinary crystals of Roweite of great size and quality for what has been known of this species and occurring on Olshanskyiite crystals. They are in groups of differentiated crystals of a light creamy color and tabular morphology, with defined faces and edges. The quality of the specimens is undoubtedly superior to what was previously known, both for the individuality of the crystals and for their sharpness, but also for the size of the crystals and their association with first class Olshanskyiite, which makes them deserving to be in the best private collections and museums. We have analyzed specimens to confirm the identity of the species and we will send a copy of the analysis to buyers. Aggregates of platy Roweite crystals of great size and quality for what has been known of this species. They are on matrix, with radial aggregates of colorless, clear and very bright Olshanskyite crystals and small Andradite crystals. The Roweite crystals, that are well differentiated, have a light creamy color with very well defined faces and edges. 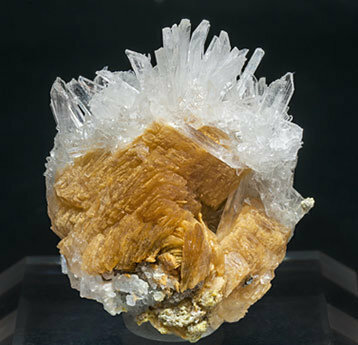 The quality of the specimens is undoubtedly superior to what was previously known, both for the individuality of the crystals and for their sharpness, but also for the size of the crystals and their association with first class Olshanskyite which makes them deserving to be in the best private collections and museums. We have analyzed specimens to confirm the identity of the species and we will send a copy of the different species to buyers. Aggregates of between laminar and tabular Roweite crystals of great size and quality for what has been known for the species. They are on matrix with small Andradite crystals. 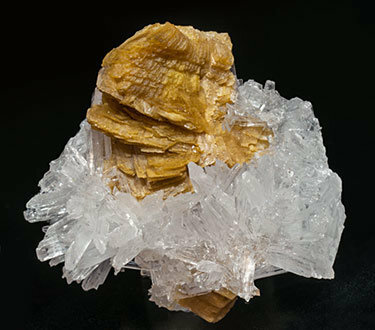 The Roweite crystals are well differentiated and have well defined faces and edges with a light creamy color and are partially coated by groups of white Olshanskyite crystals. The quality of these specimens is undoubtedly superior to what was previously known, both for the individuality of the crystals and for their sharpness, but also for their crystal size which makes them deserving to be in the best private collections and museums. We have analyzed samples to confirm the identity of the different species and we’ll send a copy of the analyses to the buyer. Aggregates of laminar Roweite crystals of great size and quality for what has been known of this species. They are on matrix, with colorless and translucent Olshanskyite crystals and small Andradite crystals. The Roweite crystals, that are well differentiated, have a light creamy color with very well defined faces and edges. 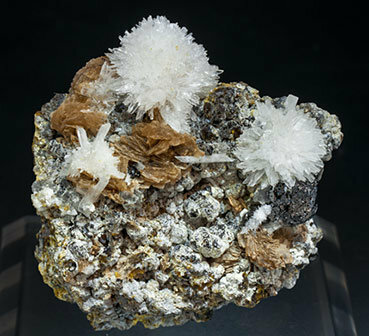 The quality of the specimens is undoubtedly superior to what was previously known, both for the individuality of the crystals and for their sharpness, but also for the size of the crystals and their association with first class Olshanskyite which makes them deserving to be in the best private collections and museums. We have analyzed specimens to confirm the identity of the species and we will send a copy of the different species to buyers. Lenticular Roweite crystals with an orange color and of great size and quality for what has been known of this species, with very sharp, colorless, clear and very bright Olshanskyite crystals, octahedral Magnetite crystals and small reddish Andradite crystals. The sample has been analyzed to confirm the identity of the species and we will send a copy of the different analyses to buyers.